An all-in-one parent communication system. Why spend hours dealing with piles of paper and messages that don’t get read when you can reduce your workload by automating all the ‘busy work’? Emancipate yourself from the drudgery of maintaining a patchwork of school management tools, and say hello to one, simple, integrated, solution. Using our digital forms and workflows, we can automate all of your administrative processes so you can accomplish more, in less time. 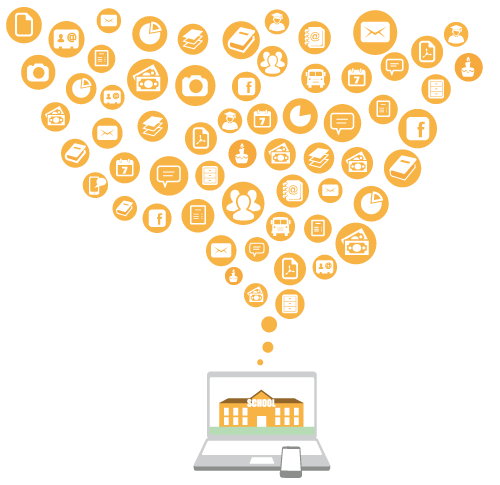 From field trips, to finding a substitute teacher, or your entire admissions process, we can reduce the entire workload to a few clicks. Forget managing multiple emails lists and databases, with Hubbli, when parents and staff are organized into communication groups, the system automatically filters information to the right people. This includes newsletters, text messages, calendar events, forms, pictures etc. Go green and cut costs with digital documents, forms, reports, newsletters, surveys, etc. Looking up records takes seconds instead of hours. Because Hubbli automatically filters information to the right parents, they only see 100% relevant information. And, by giving them a communication system that is familiar, they understand how to engage staff and each other. Events and schedules are a breeze with our synchronized and automatic system. Just set it and forget it while the system handles the rest. 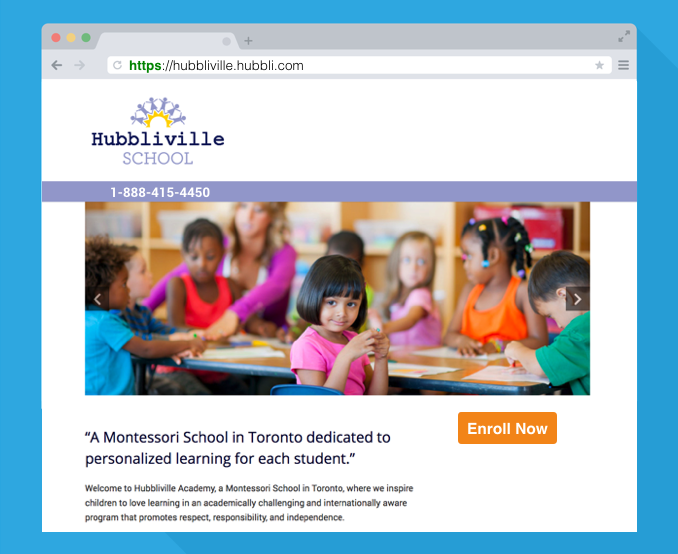 Whether you need to collect payments for incidentals like field trips and yearbooks, or you want to run a fundraising campaign, or you need a full-featured tuition management system, Hubbli’s account management features have got you covered. Hubbli can also take over the management of your school’s website. With our on-demand IT services, you never have to wonder who will make updates to your site, or worry that it’s not secure. Call, Email, or live chat with our support team, and we’ll walk you through any issues. Or, we can even act as your on-demand IT staff. Just tell us what you want, and we’ll do it for you. IT services can include forms, workflows, calendar events, appointment schedules, custom web pages, database updates, reports, etc. Hubbli delivers all of these fantastic features to you nestled within an uncomplicated and customizable website. Many of our customers use their Hubbli site as a simple password protected parent portal, while others use Hubbli to replace their existing website completely. Hubbli sites come with powerful features right out of the box, like Search Engine Optimization (SEO), and Secure Socket Layer (SSL) encryption on every page. The best part is, you don’t have to decide how you want to use it because it’s easy to customize at any time, and if you ever need any help our support team is always there for you. So even if you have a killer new website that doesn’t need replacing, your Hubbli site is there if you need to whip up a marketing campaign or fundraiser landing page. With our drag-and-drop website design tools, you can make a new page in minutes, and if you get stuck or don’t have the time, we can even do it for you. Hubbli groups are like real-time interactive newsletters that keep everyone informed and engaged when updates occur with events, forms, documents, pics, and videos. Easily organize your school community by classroom, grade, club, team, committee, administrative level, faculty, or any other grouping with Hubbli Groups. It’s simple to share (and update!) school-wide or group-specific announcements, polls, discussions, calendar events, online documents and more—and just as easy for parents, students, teachers and other school members to access them. Create & customize unlimited public, private or hidden groups and assign group admin or moderator abilities to individual teachers, staff, or parent volunteer leaders at your discretion, for better-directed, more efficient (and paperless!) communications. Guarantee that updates get delivered with group posts that send out both email and text message notifications to everyone’s mobile phones. Increase awareness, promote guided discussion and cultivate parent engagement by posting information, announcements, assignments or any other communications inside public or private Hubbli groups. The familiar style & functionality of Hubbli Groups make posting assignments, updates and contributing to staff group discussions simple for even the least ‘techy’ teacher or school admin. Same goes for parents, students, and any other school group member. You won’t be spending your time slogging through ‘reply all’ email threads or answering the same question over and over. 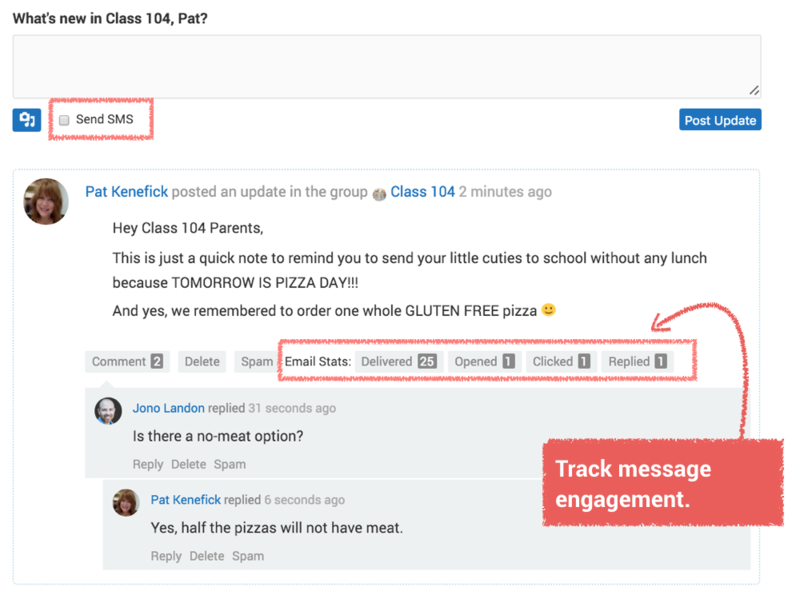 The Hubbli Groups comment feature allows group members to make comments and ask questions for the whole group to see—or turn off the comments capability to use a particular group page as a forum for one-way communications. Design, send and track email newsletters the same way you would with Constant Contact or MailChimp. 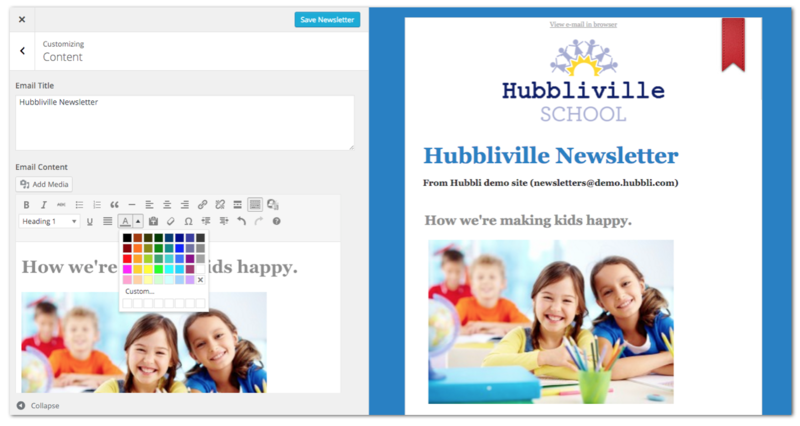 It’s easy to send a newsletter to the whole school, or any Hubbli Groups that already exist. The best part is that you don’t need to create another database to manage because it uses your existing Hubbli database. Hubbli’s Digital Forms are saving school office staff hours every day. They let you create, distribute, and receive all your school forms, polls & surveys from one convenient place. Searching through stacks of paper is a thing of the past because Hubbli automatically organizes every form submission for you. Digitally organized forms allow you to find any individual or group of entries with a few clicks of a mouse. It’s simple to create and send out forms for registration, hot lunches, parental permission, school surveys and any other information you collect on paper. Lost forms are a thing of the past when all your school-wide and group-specific forms ‘live’ on your school’s Hubbli site. Parents can conveniently access and submit the appropriate school forms from anywhere, at any time. Options like ‘required field’ mean submissions are always complete, and an electronic payment option makes paying—and collecting— fees, simple, accurate and more timely. There’s even a ‘digital signature’ field that lets parents sign necessary forms with their mouse, touchpad, or finger on a touchscreen and a mandatory ‘log in to submit’ option for full confidence in the results. Every Hubbli group has it’s own private calendar so that group admins can add events for that specific group of members. There is also a site-wide calendar that shows events meant for everyone. 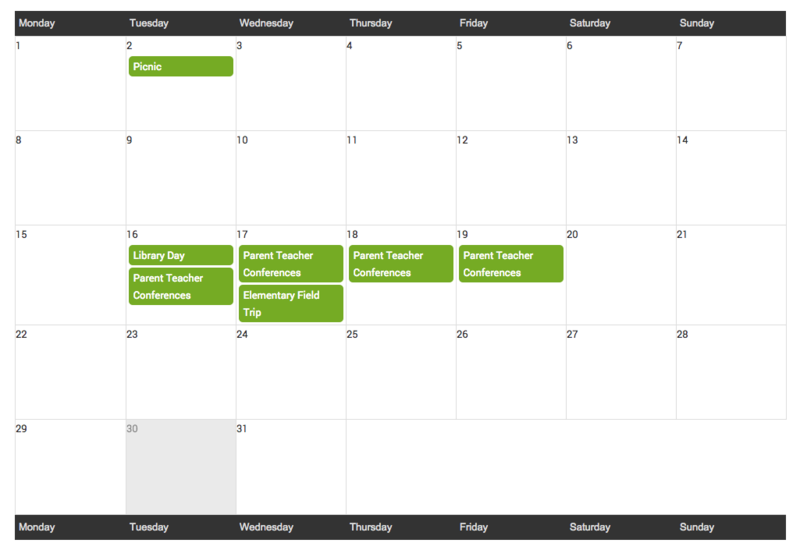 But don’t worry, they are all synced together so that when a parent uses the site-wide calendar, they get a customized view of events for the groups of which they are a member. Events can be as simple as a due date for an assignment, or you can create a media-rich event page with RSVP tracking or even sell tickets through the event page. 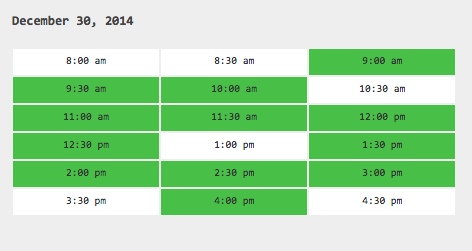 Hubbli’s automated scheduling system makes managing schools tours, and parent-teacher conferences, super simple. All you have to do is adjust the available times, and Hubbli handles the rest. Parents self-book from the remaining sessions, and they get an automated email with an invitation and automatic reminders. You just Set it and Forget it while the system does all of the work of confirming and reminding everyone, it can even handle rescheduling canceled or missed appointments. Hubbli student pages are like a digital filing cabinet for each student. Each student gets a private page in your Hubbli site so parents and staff can keep up to date in real time. 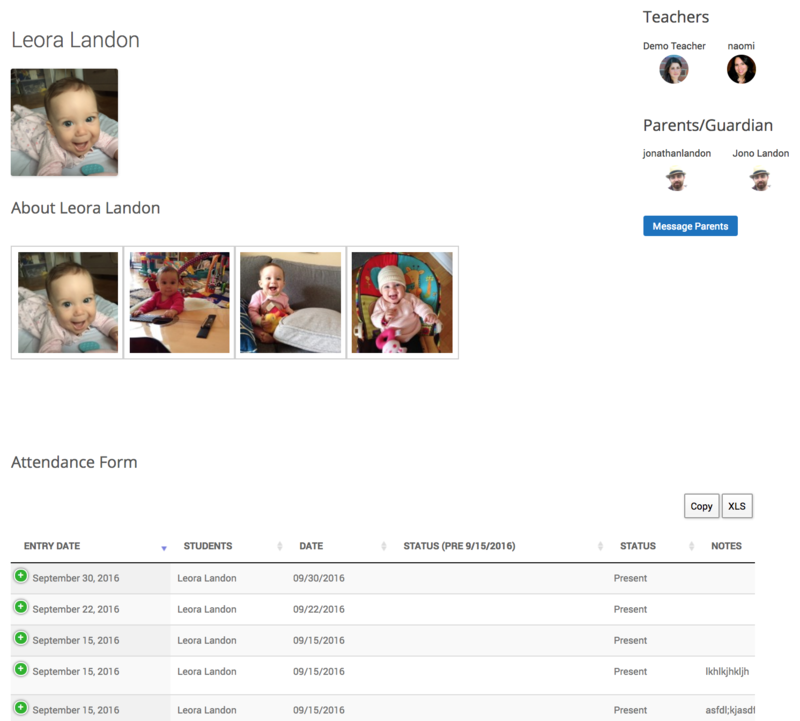 Any parent forms or teacher documentation related to a student end up there automatically. Each entry can be previewed, printed, or even edited if the user has the correct permissions. For example, let’s say the parent needs to update the emergency contact information, all they have to do is log in and click edit on a previously submitted form. Or how about an incident report made by a teacher who needs to update it with new information. Now they can log in, go to the student page and edit the entry online which they can do from any device, at any time. 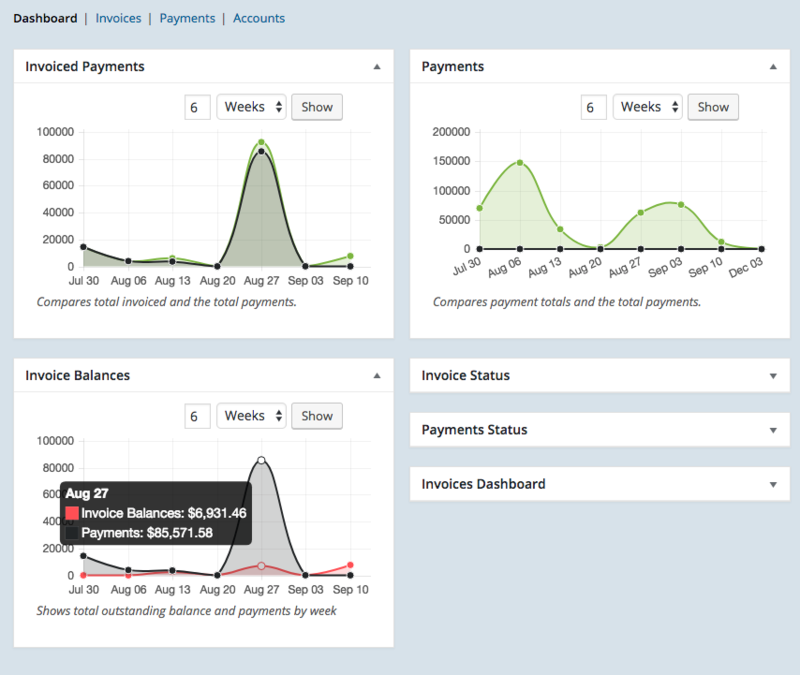 The Hubbli tuition dashboard allows you to manage your accounts at a glance. You can bill parents for tuition and all incidental fees. You can track and apply credits to any account or individual invoice. Parents can view account status and make payments from any mobile device.